A pair of UK fighter pilots have become the first in their services to fly the F-35 Lightning straight from training. Flt Lt Liam taxiing the F-35B Lightning before his first flight. Flight Lieutenant Liam and Lieutenant Chris became the first Royal Air Force and Royal Navy pilots respectively to proceed straight from flying training in a Hawk to fly the multi-role combat aircraft. It was a sensational experience and, as the culmination of many years training, was certainly the highlight of my time in the RAF so far. I was astonished at the jet’s performance and at how well the simulator had prepared me for taking the Lightning flying. Much of the first flight is about exploring the aircraft’s performance envelope and breaking the sound barrier was a particular highlight. It is easy to see why every pilot here loves flying the aircraft and I am eager to press on and get stuck in to operating the Lightning and exploring it’s potential. To fly a Lightning for the first time is almost indescribable. After over seven years of training in the Royal Navy, to finally get into the real aircraft and take it airborne was one of the proudest and most exciting experiences of my life so far. The computer systems, helmet display, and sensors are at the cutting edge of what is currently possible and I’m extremely excited to work on exploiting this potential as well as being part of its integration with HMS Queen Elizabeth and HMS Prince of Wales over the coming years. With no two seat variant of the F-35 the first flight for any pilot in a Lightning is always solo. I am delighted that our first two ab initio pilots have flown Lightning and joined the rapidly expanding cadre of UK Lightning pilots. For any military pilot the first time you fly a front line aircraft is something you never forget, but to be the first to progress straight from training to fly F-35 is something to be especially proud of. I wish both pilots every success in their future careers and look forward seeing them both in the UK this summer when 617 Squadron returns to RAF Marham. The training of UK Lightning pilots is currently undertaken as part of a much larger UK Detachment at Marine Corps Air Station Beaufort, South Carolina. This ‘pooling’ arrangement with the United States Marine Corps (USMC) facilitates the high training rate necessary for build the essential numbers of personnel qualified and experienced to form the first operational UK squadron, No. 617 Squadron (the ‘Dambusters’) in 2018. To date the cadre of UK Lightning pilots have all transitioned from other aircraft and both new Lightning pilots were accompanied on their first flights by an instructor in a second aircraft. 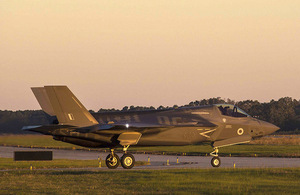 The F-35 Lightning is an advanced, next generation aircraft procured to operate alongside the RAF’s Typhoon. It will be jointly manned by the RAF and Royal Navy, and will form an integral part of Carrier Strike operating from the Queen Elizabeth Class aircraft carriers.